Made using 80% bamboo fibre, so there is plenty of antibacterial properties present to help eliminate odour. Bamboo fibre is incredibly soft and wicks moisture away from feet, leaving your child feeling comfortable all day. Cushioned terry loop sole and heel, perfect for blister protection. Woven sizing in sole for easy pairing. 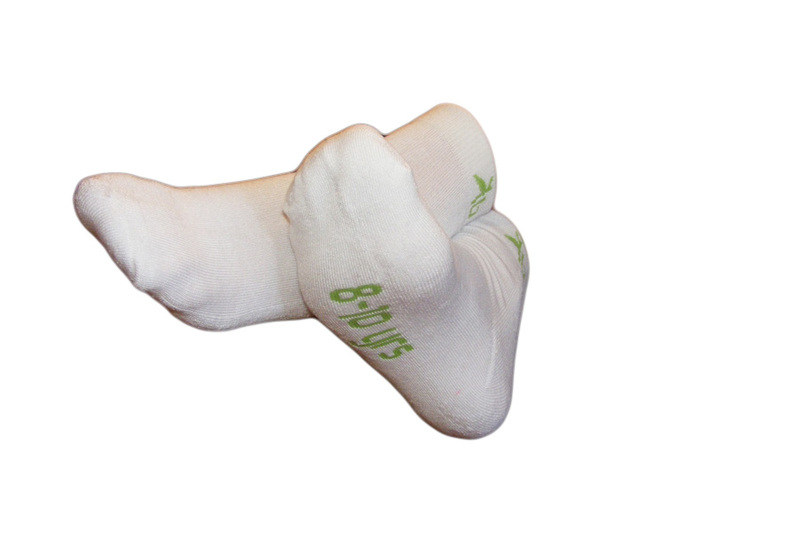 Larger size are suitable for adults as these socks have plenty of stretch. *PLEASE NOTE Bamboo fibre is a delicate fibre,this is why it is found to be so soft and comfortable. If your child wears velcro fastening shoes, runs on concrete wearing socks without shoes or rubs against hard rough surfaces fraying may occur. Please consider carefully before purchasing these socks as no refunds will be given when it is apparent the socks have been damaged due to misuse and not factory fault. These measurements are taken when sock is in a relaxed state and are approximant only. Machine washing in cold or warm water. To preserve color, line dry inside out. Do not use fabric softeners or bleaching products. *May not be suitable for children who wear velcro fastening shoes as fraying may occur .